INDIANAPOLIS (UMNS) — Bishop Leroy Charles Hodapp, 82, described as a steady, consistent and faithful leader for the United Methodist Church, died May 26 at Methodist Hospital. Born in Seymour, Ind., on Nov. 11, 1923, the retired bishop served the Indiana Area from 1984 to 1992 after serving for eight years as bishop of the Illinois Area. He was elected to the episcopacy in 1976 and retired in 1992. During his tenure as an active bishop, Hodapp served as president of the United Methodist Board of Church and Society, based in Washington, and as president of the United Methodist Board of Global Ministries in New York. “When I think of Leroy Hodapp, the word which comes to my mind is ?faithful,’” said Bishop Michael Coyner, Indiana’s current bishop. “He served 50 years under appointment, starting as a student pastor, all the way through service as a pastor, campus minister, council director, district superintendent and bishop. A half century of faithful ministerial service ? that is an amazing record,” he said. During his years as a pastor, he served Heath Memorial and Meridian Street Churches in Indianapolis and First Church in Bloomington. 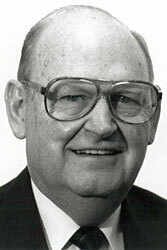 Between 1965 and 1970, he served as Northeast District superintendent, based in Indianapolis in the South Indiana Conference, and later became conference council director. He also served as Bloomington District Superintendent from 1965 to 1967 and as Indianapolis West District Supertendent from 1967 to 1968. He also was a delegate to the 1968, 1972 and 1976 General Conferences and held positions in conference agencies, including chairperson of the conference board of ordained ministry. He was on the commission to study the superintendency during the 1972-76 quadrennium. He has received a number of honorary doctorates. The bishop served as the trial officer (judge) in church trials involving sexual misconduct. He also presided over a much-publicized trial involving then-pastor Jimmy Creech, who was eventually stripped of his clergy credentials for performing a same-gender union service — a violation of church law. Hodapp attended the United Methodist-related University of Evansville, receiving his A.B. in 1944. He then attended Drew Theological Seminary and received a B.D. in 1947. That summer, he was ordained an elder by Bishop Titus Lowe — the bishop had made him a deacon two years earlier — and joined the Indiana Conference of the Methodist Church. He was appointed to Orleans Church. Coyner recalled working with Hodapp and the example that the bishop set. Hodapp is survived by his wife, Polly Anne Martin, and two daughters, Anne Lynn Gates and Nancy Ellen Wichman. A memorial service is scheduled for May 31 at the Meridian Street United Methodist Church, Indianapolis. Coyner will preside. Visitation will be May 30 from 4 to 8 p.m. at the Flanner and Buchanan Funeral Home, Carmel, Ind. A private family burial service will be held later in Evansville, Ind., where the Hodapps had lived until their recent move to the Franklin (Ind.) United Methodist Community Home. *Gangler is the director of communication for the Indiana Area of the United Methodist Church.